Comics, Games, Events and a Whole Lot More! As you may have noticed, there are some changes going on to the TJ’s website. Did you also know that there are some significant changes going on in the store as well? We’re in the midst of a transformation that will delight our customers as we expand our space upstairs to house more of the games, miniatures, comics and collectibles that you have come to expect from our shop for more than 20 years! Come on down and talk to Tom, or Paul, about what’s new, what you can expect in the future and what TJ’s is looking to deliver by the end of 2018! If you’re lucky, you might catch one of our new deals or even a glimpse of what the future holds. Bear with us as we make some changes to bring you a friendlier, easier and more open experience than ever before. May’s attendance wasn’t a fluke – the ball is rolling now! 72 players showed up at June’s Titanium Challenge – 2 players short of a record for these monthly events held at TJ Collectibles. Originally offering a prize pool of $1,000, this was quickly increased this as the Challenges kept growing and growing, currently still trending upward month after month, even as the beautiful summer months are upon us. Bolstered by a prizepool of $1,650 and room to increase further, it seems like players can’t get enough of the Modern tournament series brought into being 6 short months ago by Tom Shea and his hard working team. Old decks resurgent and new decks created were at the forefront of the 2 Modern Grand Prixs the weekend before in Kobe and Copenhagen, but it didn’t seem to affect our local metagame much. Dredge and Counters Company were some of the best performing decks at the European and Asian Grand Prixs, but you wouldn’t know it if you were at TJs on Saturday. Grixis Shadow is considered the best deck in Modern by some and has been the most popular deck in our area over the past 3 months. This seems to be in line with the reality of the global Modern metagame. This being said, there were 0(!) Dredge decks in the room Saturday and only one copy the Counter Company deck. Whether players don’t have the cards to switch or are simply enjoying their own decks, this anomalous metagame is sure to be exploited by a savvy player. After 7 rounds of Swiss competition, the field was narrowed to 8 players, with all players except one going 5-1-1 or better making Top 8. Condolences and honorable mentions to Rafi Abrahams and his BW Eldrazi deck, who defeated previous finalist Tim Connelly on camera here. This entry was posted in Blogs, MTG General, MTG News, TJ Collectibles Titanium, Tournaments on June 12, 2017. Good choices for May’s Titanium Challenge event! Good choices for May’s Titanium Challenge event. The fifth event in the Titanium Series hosted by TJ Collectibles is coming up and like all the rest it’s going to be a Singles Modern Event. The monthly events have ranged from the mid forties to the mid seventies in attendance, while the quarterly Titanium Plus Weekend has two events (both Modern) which drew a combined 300 players. What have sufficient data now to start to draw conclusions about the state of Modern in our area. In this article I hope to describe some of the tendencies we’ve seen from month to month, focusing on the general trends of the 6 Titanium events we have to work off of. In my mind there are a few different Moderns that exist. There’s the perfectly balanced Modern metagame, with a few decks taking up about 10% of the metagame – think variants of Death’s Shadow Aggro, Valakut, and Burn. Then there would be a handful of decks with varying degrees of win percentages based on things like the ease with which they’re hated out and how good players are at fighting them. There’s the MTGO metagame which has a preponderance of decks like UR Storm and Ad Naseum as well as lots of people attempting some strange combo deck – think Krark-Clan Ironworks Eggs – that they’d never think to go at a high stakes, live action tournament. Then of course there’s the metagame that exists on paper. In real life, when a player has to set aside their entire Saturday and pay a Misty Rainforest’s worth of entry fee, usually that player wants to play something more solid. A tendency that I’ve seen our players display is wanting to have control of their own destiny. This means lots of players playing decks filled with very fair cards like Knight of the Reliquary and Kolaghan’s Command. When we sleeve up our decks with Noble Hierarchs, Thoughtseizes, and Knights of the Reliquary, we convince ourselves that luck plays less of a factor in our games than if we run a linear strategy like one involving Angel’s Grace and Lightning Storm. However, players defaulting towards these midrangy cards and strategies can be used to our advantage in deciding what deck to choose. Tons of Thoughtseizes and Inquisitions are being played right now in addition to oodles of Eidolons and Kolaghan’s. These cards make it difficult to play decks that rely on single cards or narrow gameplans. As much as I love Lantern Control, I think it would be one of the worst decks to sleeve up for this weekend. Too much hate and too broad of decks to fight in terms of threat density. Another example might be UR Storm – weak to exactly the kinds of decks that show up at Titanium Challenge tournaments. So this begs the question – what should we be sleeving up in a perfect universe? Well, for one I wouldn’t be looking to play a hyperaggressive combo deck. Something like Goryo’s Vengeance or UR Storm are just too narrow and vulnerable. One of their biggest strengths is that they outpace the slower, more consistent combination decks which can prey on the midrange decks present at the event. I would be comfortable registering a combo deck like Valakut Titan or Dredge Saturday though. These decks have play against the policeman of the format, Burn while remaining resilient enough to be able to fight through the hate that the midrange decks are forced to play to disrupt combo. If combo isn’t your style, classic Spreading Seas UW control is a great choice, though I don’t think most anyone has run this deck in a Titanium event. Blue Nahiri decks with the Emrakul endgame show up at every event, but killing with Celestial Colonnade is a drag for most. Still, if you can play this deck anywhere close to its maximum equity it has to be a great choice. If you want midrange, I’m not sure what to tell you. I don’t have the on-the-ground expertise in the midrange mirrors that I’d need to make that call. Something with Death’s Shadows and Kolaghan’s Command has to be good. I’d start there and build whatever shell best fits your style and card availability. Some cards that I’m bullish on right now include: Dispel, Stubborn Denial, Anger of the Gods, and Leyline of Sanctity. One thing I’d go a little lighter on might be directed artifact hate in the sideboard – Lantern is poorly positioned and Artifact Aggro is at its nadir here in the Northeastern US. Join us on Saturday to see if my predictions are even close to accurate. If you have an interesting deck or sideboard choices, hit me up on Facebook before the event or come see me at TJs and we can do a deck tech! Thanks for reading my metagame advice and I hope to see you at TJ Collectibles this Saturday May 6th at 11am! This entry was posted in MTG General, TJ Collectibles Titanium, Tournaments on May 3, 2017. The March Titanium Challenge has concluded at TJ Collectibles, and Tim Tonelli came out on top! 74 players descended on downtown Milford, MA on a brisk Saturday morning to win Tom Shea’s money and an invitation to the Titanium Finals event slated for January 2018. The Swiss pairing system did its work on the tournament, winnowing from 74 to 8 players over 7 short rounds. Major props to Head Judge Alfred Dziewit and TJs luminary Matt Stone for an extremely well-run tournament. It was Al’s biggest tournament ever as Head Judge. Great job Al! In the quarterfinals Bryan Kelly was just squeaked out of Top 8 by Jesse Robinson’s Burn deck, despite the pair of Kor Firewalkers in Bryan’s sideboard. Had they made an appearance in the sideboarded games, Bryan might have had the right to face Tim in the semis. Nick fell in 3 close games to Tim’s Grixis deck in the first round of Top 8. The match can be found on our YouTube channel here. On the other side of the bracket, Scott was taken down quickly by Ryan’s Elf Army. Without removal for Ezuri, the Elves will quickly overrun any opponent playing fairly. The longest match in the Top 8 was when Joe Mansur came up short on gas against Daniel Campbell’s Knights of the Reliquary and co. In the semifinals, Jesse’s Burn deck faced another deck trying to quickly reduce his life total to 0. The only difference was that Tim was trying to bring HIMSELF as low as possible for his Death’s Shadows. Tim had quite the tightrope to walk though, as Jesse was trying to do the same thing he was! It took three games, but in the end 5/6s for two mana and 9/9s for one, ran down Jesse who could only put together 18 of the 20 required life points to earn his spot in the Finals. In the other match between Ryan’s Elves and Dan’s Knights, beats were traded back and forth in an extremely creature-heavy matchup. It all came down to the last combats of Game 3, however, as Daniel’s forced alpha strike came up just a little bit short against the Ezuri powered army on the other side of the board. Ryan easily cracked back for way over lethal damage. Click here for a VoD of the match. In the end, the tournament came down to just two players, captured on video here. On one side was Ryan Leverone, who has already done very well for himself in the Titanium Series. With a great winrate in the events and a few Top 8s to his name already, Ryan really wanted to lock up his spot in the Titanium Finals by taking down Tim’s Grixis Shadow deck. Tim was on a tear though, and wasn’t going to go down easily. . He shored up some of the weaknesses of the deck by using Death Shadows. Grixis Control decks are usually threat-light and can stall out in the midgame, but the namesake card of Tim’s deck added some consistency and a scary clock. The beefy Shadows did not play a huge role in the matchup though, as Tim’s grindy deck full of cards and interactions gave him tangible card advantage over the course of a game. They did their work against Ryan’s deck filled with 1/1s and 2/2s, with no inherent advantage. A mulligan to 4 in Game 1 spelled doom for Ryan. As he was shuffling up to draw his 4-card hand, Tim told him straight up how good his hand was in the matchup. Within minutes they were shuffling for Game 2. In that game, Ryan drew and resolved the singleton Chameleon Colossus, but even that wasn’t enough to stop Tim’s black-based juggernaut. Every Ezuri was drawn was dealt with, and before long Tim was swinging for lethal while Ryan extended his hand! 2nd Ryan Leverone – ELVES! I talked to Tim after the tournament, and he was humble in victory crediting the win to having great draws all day, as well as playing a very powerful 75 with the deck being well positioned for the tourney. Tim is also qualified for the Limited RPTQ – Hour of Devastation and is looking to take his game to the next level. The Titanium Finals aren’t quite a Pro Tour, but Tim can still be proud of being one of only a handful of players to qualify for an invite-only, high stakes tournament! Look for his profile, as well as the profiles of all other qualifed players over at www.mtgtitanium.com – they’ll be coming soon as we see more and more of the 24 slots fill up! There’s no denying that the hottest format right now is Modern constructed. You can play whatever you like, as long as you adhere by a few simple rules. Any style you want, any colors you want. A manabase can be built anywhere from painless and fast, to shock-filled and slow. There is plenty of room to innovate in the format – just ask veteran Scott Metcalf, who seems to be one of the only people trying to abuse the banned-in-multiple-formats Aether Vial. On the other side of the spectrum, there is extreme value in being the player taking a tried and true strategy and doing it really well – like Joseph Horton who can always be found near the top tables with his Burn deck. Personally, I have my eye on Sword of the Meek and Thopter Foundry, and am always on the lookout for a shell that can make great use of that combo. The next Titanium Challenge is already here – Sunday April 2nd! I hope you can join us at TJ Collectibles in Milford, MA for another chance to qualify for the Titanium Finals. The already-qualified Edgar Hinton and I will be providing video coverage for the event, including audio commentary and deck techs. If you have any spicy technology for the weekend, let me know on Facebook or in person on Sunday, as I’d love to see it in action and get it on camera. Hope to see you there! This entry was posted in MTG General, Tournaments on April 3, 2017. Hello everyone! We have been working on the new TJ Collectibles web site for what seems to be forever and it still isn’t finished yet. I am told that one never REALLY finishes developing their web site that it is an ever-developing entity. In the meantime please know that we ARE working on it to keep improving it. Your feedback is appreciated. Please drop me a line and share your thoughts about this site. We do hope to see everyone at Grand Prix Providence next weekend. We have done some interesting things with this event. Our side event schedule is huge. Our Prize Wall has been expanded both in size and scope. The REAL key to getting the Prize Wall to work seems to be how to modulate prize costs to event prize payouts. We are trying prizing on record. This approach seems to give everyone the most efficient fun events as it eliminates the negative effects of tiebreakers and long events. Father’s day special! Father’s who enter the Double Trouble teaming with a family member play for FREE! Double Trouble is a 2 hg sealed deck starting at 2:30. We felt that this was the perfect time for Dad to get away and sling some cards! The prizes on the prize wall are varied. We have 48 DIFFERENT booster packs going back to Alliances. We have sets, uncut sheets, lithographs, life counters, When is the last time you went to a Magic event and won packs of Alliances? Would you like to play for an uncut sheet or a foil Tarmagoyf from MM 2013? Would you prefer playing for a Commander’s Arsenal? Would you rather play for a Dark Confidant or Double Akroma play mat? At Grand Prix Providence all side events are playing for those prizes while supplies last. We have ONLY 1 foil Tarmagoyf.. This is the best idea since sleeves, which by the way are also on the prize wall. We have 4 great artists on site as well. RK Post, Scott Fischer, Eric Deschamps, and Christopher Rush will be on hand to sign your cards additional services will be available as well. Everyone loves hanging out with the artists. There are 14 quality vendors on site to meet your Magic Card needs. Quark Tees will be on site selling their cool shirts. There is something for the gamer in your life. These vendors are the ONLY people authorized to transact business at the Grand Prix. The Rhode Island Convention Center is a beautiful venue. We are in event halls A, B,and C. The doors open at 11:00 am Friday, and 8:00 am Saturday and Sunday. The convention center will have concessions open during the event. We appreciate your supporting all of our vendors. This weekend is all about having fun. Please stop by and say hello. This entry was posted in A Word from Tom Shea, GP: Providence and tagged magic, mtg on June 14, 2015. At the Special Edition: NYC comic convention, Marvel announced the new creative team for Invincible Iron Man, as well as announcing the next slate of True Believers $1 comics and debuting two of the August manga variant covers, according to IGN. Writer Brian Michael Bendis will team with artist David Marquez on the Invincible Iron Man ongoing series launching after Secret Wars. The pair has previously teamed for All-New X-Men, Guardians of the Galaxy, and Miles Morales: Ultimate Spider-Man. Iron Man is the central character of both of last week’s post-Secret Wars teasers. The new MU incarnation of Iron Man has been confirmed to be Tony Stark. Bendis also said he “isn’t as cash rich as he always is. He’s not able to fund the Avengers right now.” There will be a new love interest, new armor, and Tony’s biological parents will be revealed. Marvel debuted the August manga variant covers for Civil War #3 by Katsuya Terada (The Monkey King Vol. 1, concept artist on Cutie Honey and Blood: The Last Vampire) and Amazing Spider-Man: Renew Your Vows #4 by Yusuke Murata (Eyeshield 21, One-Punch Man. Marvel will produces manga variant covers for 20 titles including Ant-Man: Last Days #1 and House of M #1, each drawn by a popular manga artist. Capitalizing on the success of April’s True Believers program, Marvel will release a second wave of True Believers issues in September: 10 comics featuring Women of Marvel. The $1 introductory #1 issues will include Ms. Marvel, Thor, Princess Leia, Spider Gwen, Captain Marvel, Black Widow, She-Hulk, The Unbeatable Squirrel Girl, Silk, and Spider Woman. This entry was posted in Comics/Manga news and tagged comic news, comics, manga on June 9, 2015. Z-Man Games has released information on several upcoming summer releases: Apocalypse Chaos, Code of Nine, Dragon Farkle, The Voyages of Marco Polo and the Tragedy Looper Extension Pack. Scheduled for debut at Gen Con, Apocalyse Chaos is a cooperative space survival game designed by Florian Fay. A hostile alien race surrounds the ship, and players must work together to fight enemy forces, recover scientific items of interest, rescue innocents, escape alien imprisonment, and destroy the alien leader. The game includes a campaign of scenarios, or players can use the modular components to craft their own missions. The box contains 4 Player Boards, 10 Room tiles, 8 plastic pillars, 31 Enemy/Equipment cards, 90 various tokens, 5 Standees and 20 6-sided custom dice. The game is for 1-4 players, ages 13 and up, and plays in an hour. MSRP is $49.99. 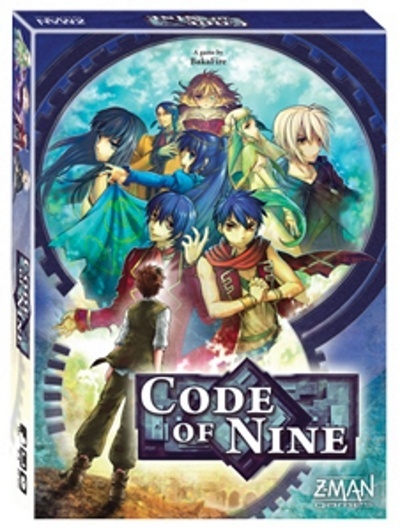 From Japanese publisher BakaFire (Tragedy Looper), Code of Nine is a mystery and deduction game in which players take the role of automatons wakening to the ruins of the world after the fall of humanity. Each player holds fragments of the will of the human race in their fading memories, and players must piece together the fragments to determine the final will of humanity and be the first to fulfill it. The scoring rules change each time, allowing for good replayability. There are also expert rules to vary the game’s difficulty. The box contains 12 player pawns, 4 Will markers, 31 item tokens, 28 cards, 4 player sheets, 4 memory lists, a round marker, a board, score sheets, and a rulebook. The game is for 3-4 players, ages 13 and up, and plays in 40 minutes. The game is scheduled for July release. MSRP is $39.99. 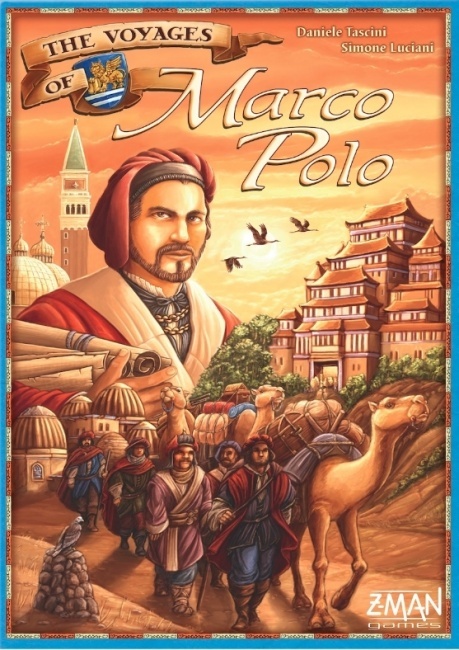 From the design team of Simone Luciani and Daniele Tascini (Tzolk’in: The Mayan Calendar) comes The Voyages of Marco Polo. The historical board game traces the route of the great explorer who traveled with his father and uncle into the uncharted East. Players roll dice to determine what resources they have, then attempt to travel and trade as they make their way to the lands of Kublai Kahn. Victory points are earned for having reached cities, including Beijing, fulfilling orders along the way, and other goals determined by secret cards revealed at the end of the game. The box contains 10 characters, 16 city bonuses and city attributes, 26 dice of various color, 40 coins, 44 different contracts, 53 cards (City and Goal cards), 123 wooden pieces, 4 player aids, 4 player boards, a start player marker, a game board and a rulebook. The game is for 2-4 players, ages 13 and up, and plays in an hour. Release is scheduled for June 24, and MSRP is $59.99. 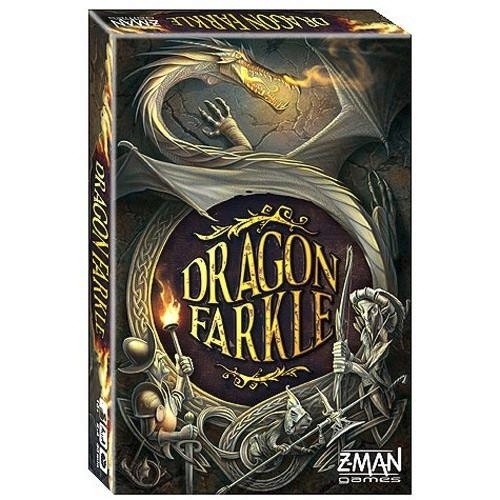 Dragon Farkle is a press-your-luck battle game of army recruitment and dragon slaying. Players must destroy the evil dragon that has been terrorizing the locals, by recruiting a group of assorted companions and equipment, and then slaying the dragon in his keep. The box contains 30 soldier dice, an event die, 10 companion cards, 20 magic item cards, 5 player mats, a dragon, 5 damage counters and rules. The game is for 2-5 players, ages 13 and up, and plays in 30 minutes. Release is planned for August and MSRP is $29.99. 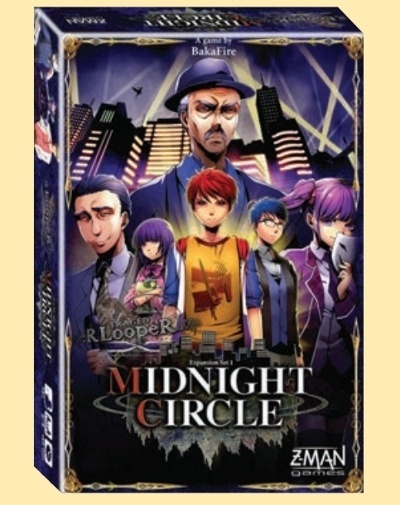 Z-Man will also release a new expansion for BakaFire’s time-travel detective game Tragedy Looper . The Tragedy Looper Extension will include three new Basic Tragedy Scripts and nine scripts for two new Tragedy Sets: Midnight Zone and Mystery Circle. The expansion is planned for July release, and has MSRP of $39.99. This entry was posted in Board game News on June 3, 2015. Universal Television has optioned the rights to the comic The Wicked + The Divine for a potential TV series, according to Deadline. The deal was via Matt Fraction and Kelly Sue DeConnick’s Milkfed Criminal Masterminds; they signed a deal with Universal earlier this year for their own and others’ intellectual property. The first story arc has shown amazing legs in graphic novel form. It was the #4 graphic novel title in comic stores in November, but has appeared in the Top 300 every month since, with sales in comic stores totaling over 17,000 copies to date. The comic series launched last year , and was nominated for three Eisner Awards. This entry was posted in Comics/Manga news and tagged comic news, comics on June 2, 2015. What?? Onslaught fetchlands are being reprinted in Khans of Tarkir?? WOW!!!! I like most players was very excited to see this reprint. We all knew it was coming but so quickly and in standard was a surprise to say the least. The new artwork was also a surprise, which brings me to this weeks topic. Does new artwork on staple cards help the older version to retain their value? All these plummeted after the reprint announcement, and were actually falling before as players were well aware a reprint was coming. Now 6 months later prices are starting to move back upwards on the Onslaught fetches. The increase may be small but the cards are trending up which is a good sign for those who held onto these cards. Will they ever reach their previous price highs is unknown but im onboard for the ride. Foils of course are a different story, Onslaught foil fetches are at a very high prices and will only go higher in the future. I guess the same could be said for the new art fetches from Khans, the foil versions of these reprints will at least climb in price and be some of the most sought after cards from said release. When I talked to players after the set was spoiled most financially knowledgable players mentioned the foil fetches as their acquisition targets for this set! So grabbing Khans foil fetches may be a smart grab currently as they seem to be a surefire profit machine in the future. Playable in all formats currently makes these cards very attractive!! Next week onto the Zendikar fetch reprint possibilty and some talk on their prices. This entry was posted in Blogs on May 28, 2015. 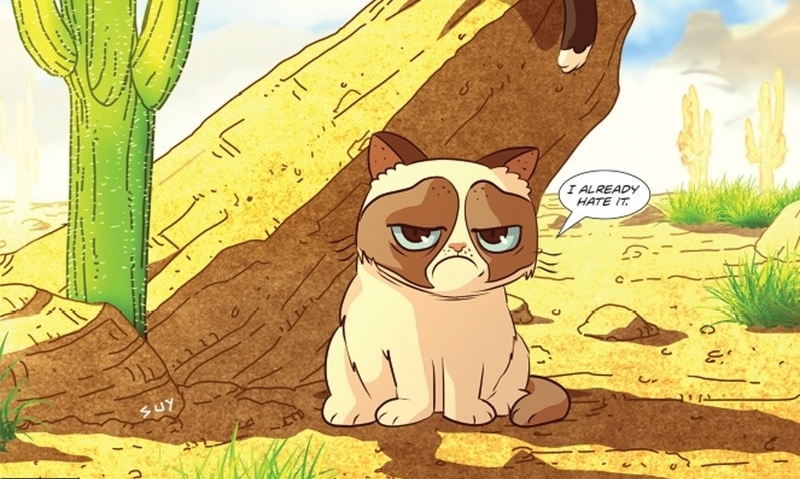 Dynamite announced a licensing partnership with Grumpy Cat Limited to bring the internet celebri-cat Grumpy Cat to print and digital comics. 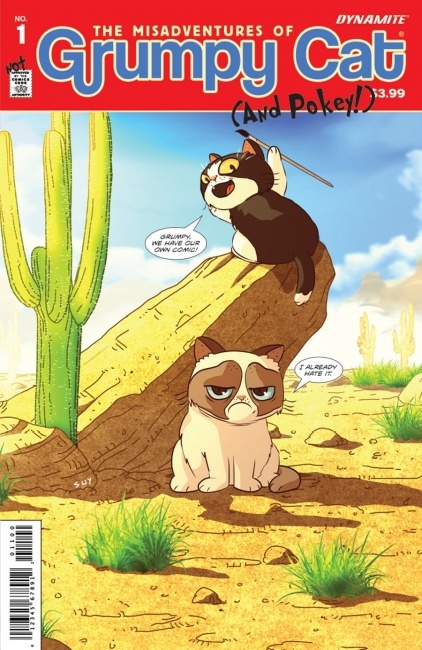 The first comic adaptation, a three-issue miniseries starring Grumpy Cat and her brother Pokey, will release this fall. The miniseries will be collected into a hardcover graphic novel in time for holiday release. Dynamite also plans to launch a new website this summer featuring weekly Grmpy Cat comic strips. Grumpy Cat, aka Tartar Sauce, started out her meme life on Reddit, where her adorable perma-scowl (which her owner says is the result of feline dwarfism) quickly spread to Facebook, Twitter, and YouTube. Her owner, Tabatha Bundesen, capitalized on the kitty’s success with two New York Times bestselling books, a Lifetime TV Christmas special, numerous TV and product spots, and merchandise that ranges from an iced coffee drink to a line of Ultra PRO game accessories. Her Facebook fans currently number over 7.6 million, and her YouTube video views have topped 31 million. This entry was posted in Comics/Manga news on May 27, 2015. Game Room Hours: Closes 15 minutes before store.